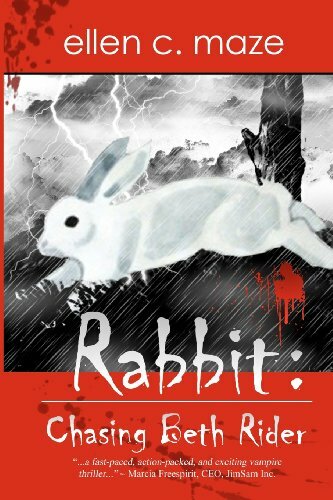 RABBIT:CHASING BETH RIDER has been re-published & re-edited for 2017 by Little Roni Publishers. Click "Paperback" or search the above ISBN to get the newest version. Cover is black with a gold seal. Whoever thought writing a bestseller could be so dangerous? Author Beth Rider's second vampire novel has hit number one and she is flying high on her new-found fame, but at a fated book signing that runs late into the night, Beth is confronted by an evil she'd only experienced in nightmares. Jack Dawn, a supernatural monster belonging to an ancient race of bloodthirsty immortals known as the Rakum, vows to track down and kill the young writer because of the vile redemptive message her book is bringing his people.The Rakum have spread evil among mankind since the Beginning, growing in strength and influence with every passing century. Jack's proselyte Michael Stone was brought up from his youth to be strong, sensible and oftentimes, brutal. But when he stumbles upon the beautiful and apparently innocent Beth Rider, he is instantly smitten, despite the fact that a few seconds later he realizes that she is the target of his Elder's fury. Puzzled by Jack's unreasonable condemnation, Michael takes it upon himself to protect the lovely author from the limitless lust of his brethren. Facing the most terrifying trial of her life against creatures known only in fables, one simple woman will unintentionally threaten the very existence of a powerful and accursed people. In the climactic mêlée, it is a race to the death, or if Beth has her way, a race to the life-of every Rakum who makes the choice. If you have any questions about this product by TreasureLine Publishing, contact us by completing and submitting the form below. If you are looking for a specif part number, please include it with your message.